In 2014 the Blue Mountains World Heritage Institute played a significant role in the successful hosting of the IUCN World Parks Congress. The World Parks Congress happens only every ten years and 2014 saw the event hosted in Australia for the first time ever. The WPC is the world’s premier global event for parks and protected areas and it plays a key role in shaping the future for these areas and the major societal contribution they make. The Sydney Congress attracted over 6,000 delegates from 170 countries. The BMWHI was prominent at the Congress through presentations in Stream sessions, showcasing the Fire Stories documentary, supporting the Dunphy Re-enactment Walk in the Greater Blue Mountains and through conducting one of the most successful of the post-Congress field trips. At the November PlanetFest open public day we operated an information stall in collaboration with the Colong Foundation for Wilderness. PlanetFest attracted thousands of visitors who were able to engage with the Institute staff and witness the scope of material at the WPC. 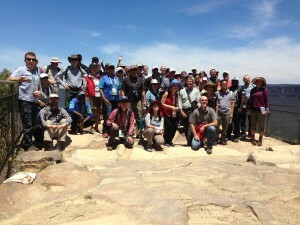 Following the Congress, BMWHI hosted a field trip to the Blue Mountains for around 50 delegates from 20 countries. The focus of the trip was on the BMWHI's Low Carbon Tourism initiative which is working to position the Blue Mountains as Australia’s first low carbon tourism destination. The project is being initially piloted in the Upper Mountains in partnership with tourism businesses, Blue Mountains Lithgow, Oberon Tourism, Blue Mountains City Council and the NSW Office of Environment & Heritage. Delegates learned about the ways in which partnerships between business, government academia and community can ensure that tourism remains a mainstay of the Blue Mountains economy whilst protecting the very natural and cultural assets on which it depends. International guests were able to encounter some of the wonders of the Blue Mountains, met local people and enjoy sharing their experiences on tourism management in national parks and World Heritage areas. WPC 2014 PNG Delegation with Dr Rosalie Chapple on our Low Carbon Grand Cliff Top tour. Post congress field trip to the Blue Mountains with 49 international delegates featuring the Institute’s Low Carbon Tourism initiative.